It was that time of year again where all the hotels sell out in San Diego, and the people who got the oh-so-coveted tickets don their best superhero costume and wait in line to get the juiciest tidbits of their favorite show. If you were driving by the San Diego convention center and you saw Spiderman, the Predator, orange hairy thing, and Sailor Moon wannabees all walking alongside people carrying Walking Dead back packs, then you were in the right place. And if you have Kevin Smith broadcasting interviews from a yacht for Comic-Con, you know it’s not just comic books anymore. Hollywood star power is on the way. Welcome to the 49th annual San Diego Comic-Con International convention! 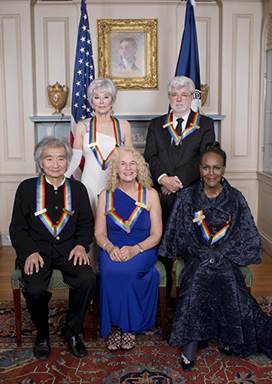 The Annual 38th Annual Kennedy Center Honors Five Legends! Seiji Ozawa. Carole King. Cicely Tyson. Rita Moreno. George Lucas. These are the five legendary talents who are being feted at the 38th Annual Kennedy Center Honors to be broadcast on Tuesday, December 29th (CBS, 9/8C). Follow the jump to check out the program for the evening.